You can’t shovel sand with a pitchfork. 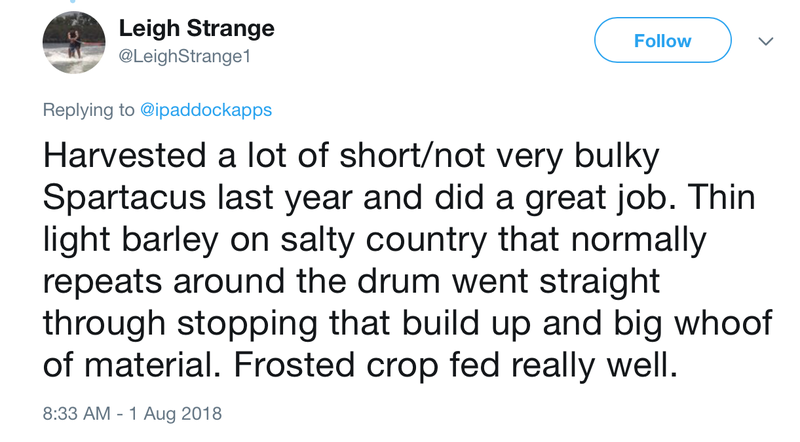 Most people who have so far bought Turbodrums, have done so to get the well known increase in throughput, especially in canola and legumes, but also in heavy, frosted or fluffy cereal crops (plus of course because they are sick of the standard drums breaking down). 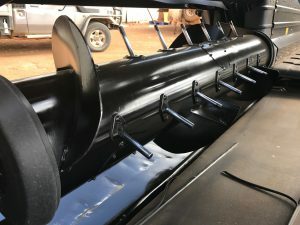 However with large parts of Australia currently in the grip of a shocking drought, a lot of people are wanting to know if the Turbodrum will also help to improve productivity with the opposite problem: light, uneven and droughted crops. Comments like Leigh’s are like gold for me, because they validate the years of work that I put into a design like the Turbodrum. 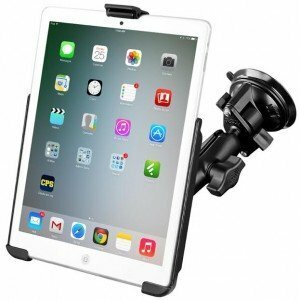 One of the totally unique features that I was excited to be able to design into the Turbodrum is the iPaddock “Paddle Flights” (patent pending), which for those who haven’t yet seen one are angular or “helical” paddles strategically welded into the centre section of the drum: half paddle, half flight. I am expecting the Paddle Flights on Turbodrums will make a lot of header driver’s lives easier this harvest. I designed the Paddle flights specifically to keep the floor under the drum clean, as any buildup of “dead” material in that zone instantly causes repeats around and over the drum, ultimately leading to a major blockage, or at best, a nasty slug up the feeder house. As anyone who has harvested light crops knows, retractable fingers are hopeless in short, light crops when you can’t get any straw in with the heads on your front. It’s like trying to shovel sand with a pitchfork. 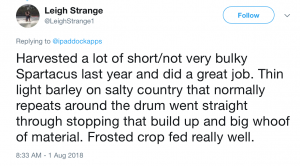 Throw in the fact that conventional feed drums have a pathetic scarcity of fingers (usually less than half as many as the Turbodrum), and it becomes like trying to shovel sand with a pitchfork – with 2 tines snapped off! The result being that partly thrashed material builds up on the floor under the feed drum, which stops the smooth transition flow into the feeder house, and around and around it goes. Of course it’s never as simple as one piece or another, and like everything the secret to the performance of the Turbodrum is more about a combination of so many incremental design changes; but having the Paddle Flights in the centre is definitely a game changer. Our second year of farming (1994) was an absolute shocker, and we averaged barely 0.3t/Ha (as a footnote, we delivered 1 measly road train a week; 5 for the whole harvest! It was a tough 2nd year farming for sure). I was forced to learn fast how to get a tin front feeding with almost no material going through it. Back then in pure desperation we bolted some rubber flaps onto the centre of the spiral which helped a lot, but the problem then was that they then caused repeats in any of the better patches! 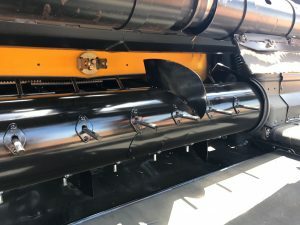 So when I was designing the Turbodrum I wanted a durable feed drum that fixed the big issues we have harvesting bulky and heavy crops, but I also wanted to make it so it would be superior in light crops as well. The difference here in Esperance between last season and this season is a classic reminder that no two years are the same. And no one wants to bolt rubber flaps onto their feed drum these days! It’s great to hear from switched on farmers like Leigh, that the theory also works in practice. For a lot of farmers this year the purse strings will be held tight, and upgrading the header will be very low on the list of priorities. At the same time there is no joy at all in watching what little grain is coming in going around and around the feed drum until it stops altogether. If you are worried about how your draper front will cope getting droughted crops into the feeder house this year, even with a tight budget it might still be a good year to think about a Turbodrum. Get on Twitter or Facebook and see what other people have found. If Leigh’s experience is anything to go by, it may just be the best $5k you spend all year.